Download for free the audio files taken from POP circa 1963. Purchase today and receive an oversized postcard featuring an original advertisement for POP. L.A.’s modernist Googie design met head-on with Surf, Tiki and Rock ‘n’ Roll culture in a Nautical-based theme park. Pacific Ocean Park—or as it was commonly known in Los Angeles from the ’50s through the ’70s, P.O.P.—was extraordinary in both its glamorous rise and spectacular fall. As a family-oriented attraction in the late ’50s with modernist-styled rides designed by Hollywood’s best, P.O.P.’s attendance surpassed that of Disneyland. 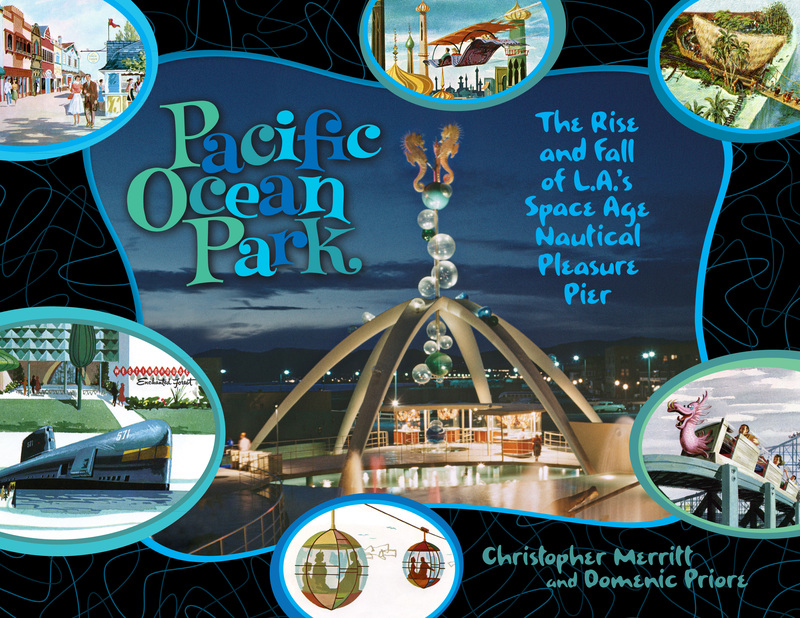 Christopher Merritt and Domenic Priore’s spectacularly visual history includes hundreds of images, most of them unseen elsewhere, including original ride designs and illustrations, of Tiki-rich, space age, and nautical rides. P.O.P. was often widely seen in movies and television shows throughout the ’60s. Its auditorium, Cheetah, hosted important early rock shows, including those by Ritchie Valens, Sam Cooke, The Beach Boys, The Byrds, The Doors, and Pink Floyd. P.O.P. was located at the dividing line between Santa Monica and Venice, the only spot during Prohibition-era Los Angeles were residents were allowed to dance and consort in a carnival-like atmosphere. The book also backgrounds the infamous “Dogtown” of the ‘70s in which surfers took advantage of big waves that rolled through P.O.P.’s rotting piers near homeless junkies. Buyers will be able to download audio files in all P.O.P.’s attractions. Christopher Merritt currently designs amusement parks in Asia and also co-wrote Knott’s Preserved. Domenic Priore also co-wrote the celebrated volumes Riot on Sunset Strip, Pop Surf Culture, and Smile: The Story of Brian Wilson’s Lost Masterpiece. 1963 Radio Commercial #1 “There’s something fun for everyone at P.O.P. !” This radio commercial from 1963 summarizes the playful sense of sun and fun the park was trying to espouse during its short-lived run. Courtesy Poo-Bah Records. Pacific Ocean Park – Water Fountain (Entrance) This brief live recording from 1962 gives a snippet of the “needle drop” music played at the entrance to Pacific Ocean Park, known as “Neptune’s Courtyard.” Courtesy Christopher Merritt. Pacific Ocean Park – Seals Also from 1962, this live recording of the Seal Pool features a looping recording, encouraging purchase of seal food – “two bags for 25¢.” Courtesy Christopher Merritt. Pacific Ocean Park – Roller Coaster, Sea Ram and Carousel This 1962 recording gives a sense of the sounds one would hear strolling through the P.O.P. Midway – known as “Ports O’ P.O.P.” Courtesy Christopher Merritt. Pacific Ocean Park – Batter Up, Flying Dutchman, Shooting Gallery, Derby and Flyer More 1962 – ambiance from the Midway, including live “pure carny” patter from various operators of games of chance. The rotating mechanism for Mr. Dolphin/Mahi Mahi can be heard at the end. Courtesy Christopher Merritt. Pacific Ocean Park – Boat Ride This 1962 live spiel from the drivers taking guests around Santa Monica Bay on the Polynesian Trader Boats, clearly takes a cue from the wisecracking antics of Disney’s Jungle Cruise. Courtesy Christopher Merritt. 1963 Radio Commercial #2 A more “swinging,” alternate version of the 1963 radio commercial. Courtesy Poo-Bah Records. Flight To Mars – Spaceship Starshine blast off “Welcome aboard Spaceway Rocket Liner Starshine. As we only use artificial gravity in space, you will experience acceleration in the first few moments of blast off…” The Flight to Mars attraction was a unique trip to the red planet that offered guests to blast off and walk around the surface of the red planet. Courtesy Poo-Bah Records. Fun Forest – Haunted Tree Maze sound effects Labeled “Maze Entrance” on the master tapes, this is the sound effect loop played at the entrance to (and within) the Haunted Tree Maze found in the Fun Forest. Courtesy Poo-Bah Records. Davy Jones Locker – mirror room sfx Featuring a poor man’s Peter Lorre, this tape loop played in the mirror room inside Davy Jones Locker. Courtesy Poo-Bah Records. Davy Jones Locker – exit spiel Another poor imitation – this time of Boris Karloff – informs guests that they have reached the exit of Davy Jones Locker. Courtesy Poo-Bah Records. Sea Tub Adventure – Electric Eel sfx In addition to an attack by a giant, rubber octopus, riders were also menaced by an electric eel. Courtesy Poo-Bah Records. Safari Dark Ride – sfx Gorillas and Elephants A dual-track recording of some of the animals found in the dark ride known as Safari. The infamous attraction gave riders guns to shoot the animals with. Courtesy Poo-Bah Records. Mystery Island Banana Train Ride – Ticket Booth spiel The “don’t miss” attraction of Pacific Ocean Park. If guests approaching the huge A-frame hut, volcano and waterfall had any doubts about riding, this 1959 spiel likely convinced them. Courtesy Poo-Bah Records. Mystery Island Banana Train Ride – Jungle sfx? Labeled as “Jungle Noise,” this is likely the ambient jungle sound effects guests heard while queuing up for the Banana Train Ride. Courtesy Poo-Bah Records. Mystery Island Banana Train Ride – Goony Bird “Thank you for riding with us!” With maniacal laughter, the infamous Goony Bird bid guests adieu at the end of the Banana Train Ride. Courtesy Poo-Bah Records. 1963 Radio Jingle – full song The full-length narrative version of the 1963 P.O.P. commercial. Courtesy Poo-Bah Records. Pacific Ocean Park Teenage Fair broadcast part 2 Broadcast on April 13, 1962, the half-hour radio program “KNX Kaleidoscope” interviews several of the participants touting the then new “Teenage Fair” at P.O.P. A rare chance to hear Jack Morehart and Teenage Fair producer Al Burton describe the scene at P.O.P. Favorite moment – hearing Burton explain how he’ll deal with unruly crowds of teens: “Well, I must say we will have awfully good supervision, it’ll be like having a chaperone about two houses down from a good party. In other words, if trouble starts to develop, we’ll be able to crush it…” Courtesy David Doherty. 09. Maze Entrance - Davy Jones Locker? 12. Pirate Ship - Sea Tub Adventure interior sfx? 16. Mystery Island Banana Train Ride - Jungle sfx?